Delvcam DELV-7XL-CBLPK Cable Pack for DELV-7XL Series LCD Monitors. DELV-7XL-CBLPK Includes 1 Each of: DELV-2MM4X-6 Delvcam Power Cable 4-Pin XLR Male to 2.1mm Plug 6 Foot. DELV-AVBX-6 Delvcam AV Cable 3.5mm TRRS to BNC and XLR Male Plugs 6 Foot. 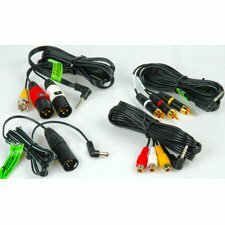 DELV-AVRCA-6 Delvcam Breakout AV Cable 3.5mm TRRS to RCA Male Plugs 6 Foot. DELV-RAAVCAB-6 Delvcam RA 4 Cond 3.5mm Plug to 3 RCA 6 FT AV Cable. If you have any questions about this product by Delvcam, contact us by completing and submitting the form below. If you are looking for a specif part number, please include it with your message.